Like A BMI Chart But For Your Swimming ~ Feel For The Water! Advice & Tips to Improve Your Swimming. A BMI chart takes your height and weight, and shows you whether you are overweight, underweight or about right. It's not completely perfect (for instance if you've been spending a lot of time pumping iron in the gym then you might be heavy but not actually overweight) but it's a pretty good guide. This has two axes, your swimming speed (time per 100m) and your stroke rate (the number of strokes per minute you take counting both arms). The Red Zone indicates your stroke rate is too high for your swimming speed. If you are in this zone, there's a strong likelihood you are fighting the water - a low body position, crossovers and scissor kicks are common. The Blue Zone indicates your stroke rate is too low for your swimming speed. 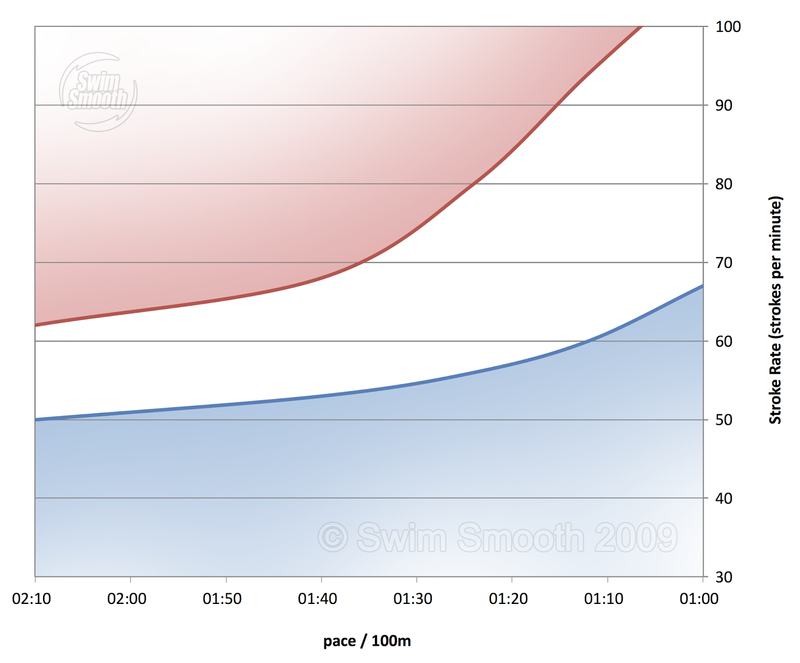 If you are in this zone it's likely you have a pause and glide in your stroke timing which is holding you back. You are also likely to be dropping the wrist and pushing forwards on the water - we call this "putting on the brakes" and it's fundamentally connected to over-gliding. The White Zone is where you should be. That's not to say that your stroke is perfect but it says that your stroke rate is about where it should be and changing it is not something to be focused on. 1) Your individual height and build. Taller swimmers with long arms naturally have a longer stroke with a slightly slower turn-over. 2) Your individual stroke style. For instance if you have an effective 6 beat kick and like to use it then your stroke will be longer with a slightly slower turn-over for a given speed. You used to be able to input your own personal stroke rate and pace to see it on your stroke rate chart. have you taken that functionality down as I found it very useful! I'm a 55 year old fitness swimmer training 2x/week 30mins; for 25+years. What would be a good 100m split for someone like me? thanks Adam, I spent ages trying to find it! Hi Mark - I wouldn't like to say to be honest - one's person's "good" is another person's "average"! What times are you swimming at the moment?